Well good morning to you too already 85 degree at 8 am (and rising to 95 degrees) San Diego! I'm doing hot, how about you? With a week where the heat is inescapable, no matter how much of an early riser you are, refreshment is in order. And what a refresher this is. Cool, minty, deliciousness sure goes down easy on a scorcher like today. This shake is not only tasty (and like drinking dessert for breakfast) but also has, wait for it... Health benefits! 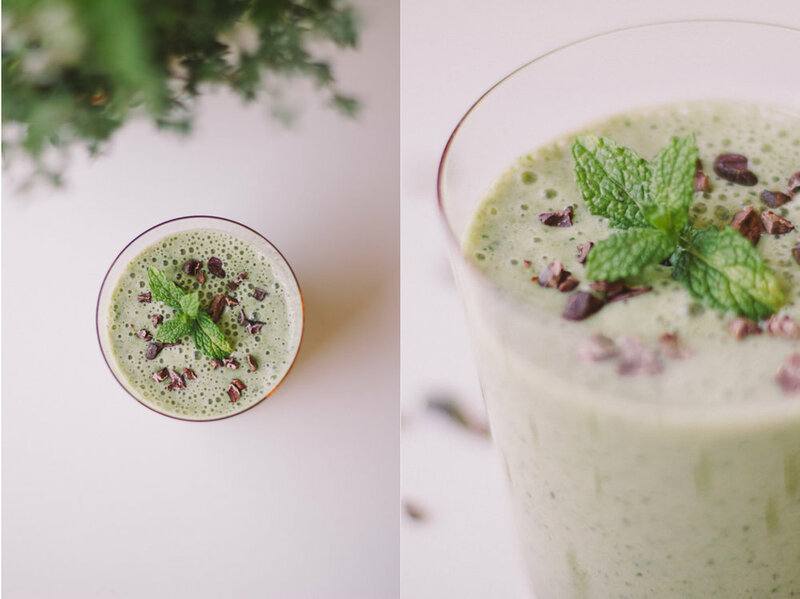 With a mix of power greens and energizing maca, this superfood shake is the perfect start to even the hottest of mornings or mid-day cool down. A big thank you to Janelle for gifting me the Raw Cacao Nibs from Parliament Chocolate used in this recipe! They are delicious, full of the heady scent of chocolate, and come in the prettiest package. Place all ingredients (except cacao nibs) in blender, beginning with the frozen banana. Pour the almond milk over the top, and blend until smooth. Divide between glasses, and stir in cacao nibs. Finish with an extra sprinkle of cacao nibs to top. Enjoy!